The concept of bonus shares is weirdly fascinating. It’s just the moving of something from one account in the books to another. It’s total nonsense from an accounting perspective – it does nothing to increase the value of a company, and therefore, it adds nothing to the value of a shareholder. And now, its actually a problem for long term owners of stock. Because of the peculiar nature of the recent stock law that brings about long term capital gains taxes. The bonus will just increase your tax especially if you sell in the near future. For stocks bought after Jan 31, 2018, the purchase price is as per actuals. For bonus shares, the purchase price is zero. Consider now that a company is offering a bonus now, 1:1. You get one new share for a share you own. Let’s say you’ve held that share for a long time, more than a year now. Price on Jan 31, 2018: Rs. 1100. Price on the “Bonus” day: Rs. 1300.
one share at the price you bought (Rs. 100) or of Jan 31, 2018 (Rs. 1,100) whichever is higher. In this case, the purchase price Rs. 1,100. After the bonus, the share will fall to Rs. 650 because the current price of Rs. 1300 will be split into two shares. What if you decide to sell shares soon? Let’s say in a year or so, the stock stays at Rs. 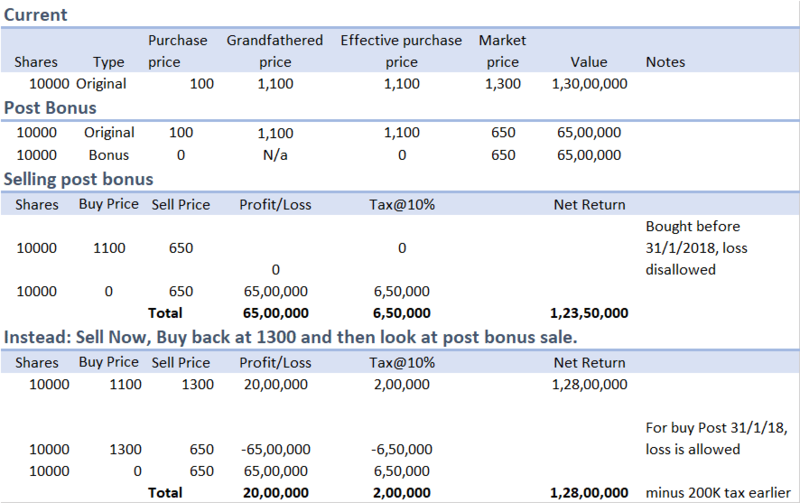 650 (after the bonus) and you want to sell both your shares. How does the tax system work? One share was bought at Rs. 1,100, remember? You will sell that share at Rs. 650. That’s a Rs. 450 loss. But that loss is not acceptable – see Rule #2) above. So you can’t claim the loss. The second share was bought at Rs. 0 – the “bonus” share. This is also sold at Rs. 650. Which means a profit of Rs. 650 per share. Effectively you have a Rs. 650 profit on one share, and a Rs. 450 loss on the other which you aren’t allowed. What if there was no bonus? Does the profit or tax change? You only have one share, at Rs. 1300. Bought at Rs. 1,100 as per the rule. Taxon this profit : Rs. 20. If you own one share, the difference isn’t that much. But if you own 10,000 shares, your tax differential is nearly Rs. 450,000! If you sell at Rs. 1,300 you’ll pay tax on the profit (Rs. 200) at Rs. 20 per share. You buy back a few days later at Rs. 1,300 and then you’ll get two shares in the bonus issue. This won’t have any of the grandfathering tax rules as it is bought after Jan 31. Which means, you are allowed to take the loss on the first share and offset it against the profit on the second one. You will not have to pay any taxes unless the share goes further up from here – which would apply even otherwise. You could in fact further avoid the tax. After the bonus, sell about 3% of your holding at the half price, and you will get a loss (since it’s the pre-bonus shares that are being sold) and that will negate your profit, so no tax payable either. If you’re a stickler for the position, buy back the 3% position again, three days later, and there’s no taxation involved. Here’s the calculation if you have 10,000 shares. If you do this, you have to pay a 1% roundtrip cost (0.25% will be STT, then you’ll have brokerage and the rest). Then you have the tax on the current profit that you’re booking. So it might not be worth it – just pay the tax when you do exit. This Tax Differential Reduces As The Stock Goes Up, Though. Let’s say the stock doubles over a year. Then, there will be no tax differential between a process of selling now and buying back, and holding on for a year. Because the differential comes because of the lack of tax-recognition of a loss. And if the stock doubles, there’s no loss on either tranche – the original or the bonus share. Bonus issues are a pain for you if you are a long term investor looking to exit soon. If so, it’s better to exit now and enter again later. This might be valid for FII investors who might need to be considering exits, since they are taxed like Indian individuals. For mutual funds and other domestic institutions, there’s no tax, so they don’t care either ways. If you however continue to believe that the stock you hold will double, then don’t do anything. Lastly, if you’re looking to totally exit in a year or so, you might just consider selling and buying back as above. This is super complicated. Unnecessarily so because of the tax laws. There’s a saying that only two things are constant: Death and Taxes. And like in this case, Death because of Taxes.